The Wisconsin shooting drill is a great warm up drill for players and goalies. It incorporates some key skills for forwards and defense and allows for multiple repetitions. Goalies will see lots of shots from all angles and focus on rebound control. 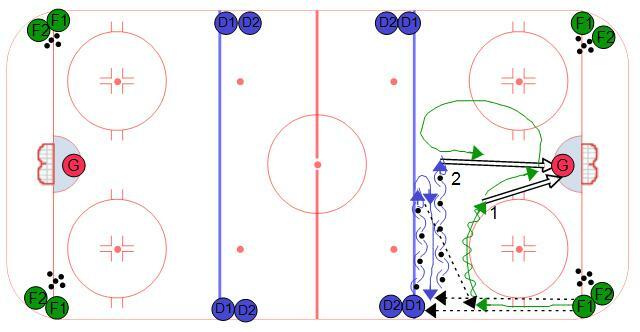 This drill can be used in full and half ice practices. F1 starts the drill with a pass to D1. D1 will carry the puck to the center of the ice while F1 skates up the wall to about the top of the circles and receive a pass back from D1. When they receive the pass, F1 will explode off the wall into the slot for a shot on net. After the shot F1 will retreat to the high slot and look for a rebound off of the second shot from D1. After the defense makes the pass to F1 they sprint back to the wall and receive a second puck from F2. This time the defense carries the puck to the middle of the ice and shoots. After the second shot the first forward starts the drill from the other corner.